32 posts categorized "streaming media"
HBO refuses to deal with Neflix, but why ever not? It's a total failure to maximize the value of its content. When Netflix teamed with Internet Server maker NGINX to design the open source servers for its content delivery network (CDN), it turned out to be a good match for all concerned -- including ISPs who got low-maintenance, highly efficient servers and users who should get smoother streaming of Netflix content. Netflix announced it was launching its own Content Delivery Network (CDN) this week and it was open sourcing the hardware design and software. That makes it doubly interesting and could help ISPs ease the burden of Netflix traffic across their systems. Read my full post the Real User Monitoring blog. Photo by Matt Perreault on Flickr. Used under Creative Commons License. Trying to tie a cable contract to a Hulu subscription is about the most bone-headed idea I've heard in a long time. Just a desperate attempt to save a dying business model. Streaming is clearly the future of content delivery. You might never have heard of Nollywood, the nick name for the Nigerian film industry, but it's the second largest film producer in the world and it could teach Hollywood a thing or two about the advantages of digital distribution on the Internet. Photo by lisa_eglinton on Flickr. Used under Creative Commons License. As eyeballs shift away from traditional TV to streaming media outlets, why would the networks sell off their streaming media arm? Perhaps because they're short-sighted and down-right stupid. I posted a couple of links this week about TV ownership going down and DVD sales numbers dropping. The two related bits of news got me thinking about the changing face of TV and the growing influence of streaming media and the Internet. Netflix seems on its way to dominating the streaming media market. That may not be the best thing for consumers. Two very different stories came together this week that could have an impact on the future of TV . 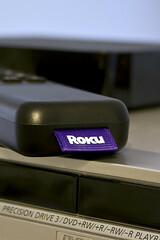 The Justice Dept approved the Comcast - NBC Universal deal and Roku cut a deal directly with WealthTV. In this blog post, I analyze why these two stories are significant.